Do you believe in Spirit Guides, or perhaps Guardian Angels? Do you ever put a name to that inner voice that whispers to you? I have always believed in both, but until recently I did not have the name of my Muse. Now, I know her name is Dorothy, and is it wonderful to be able to put a name to the voice. My husband and I recently visited a lovely shop in Paducah (Kentucky), called Wildhair Studios’ Rock Shop. As soon as I walked into the shop, I was drawn to the rack of pendulums. My friend, who does Healing Touch uses one, and although I did not know what I (personally) would use one for, I knew I wanted (or perhaps needed) one. There were so many beautiful pendulums, it was hard to decide which to purchase. I picked up one, which I thought particularly dainty and pretty. It began to spin counter-clockwise. I read the information posted next to the stand, and realized that meant “No.” I asked my husband to hold it, and it spun clockwise, which meant “Yes.” I told one of the employees that the pendulum appeared to not like me, so he offered advice on how to center myself and suggestions I try again. This time, it practically screamed: “NO!” I tried a few other pendulums, and all had the same answer of “No.” Finally, I picked up one that began spinning immediately, shouting: “YES!” Of course I bought it, and tucked it away in my purse. In all honesty, I do not know much about pendulums, but I look forward to learning. Upon returning home, I had a “Getting to know your pendulum” session. I still don’t know why, but I asked if it had a name, even though that was not suggested in any of the readings I did. A few minutes into our session, the question came out of my mouth: “Do you have a name?” The answer was: “Yes.” So then I started asking: “Is ______ your name?” It took several names before I found the right one. The only name, I received a “Yes” to was Dorothy. When I chose my pen-name to write under, I always thought it was in honor of my great-grandmother, and in some ways it was; however, now I realize that it was also my Inner Voice (aka Spirit Guide/Angel/Muse) wanting to be heard. I love that I found my pendulum, and have a new tool to use on my spiritual journey. I love that we have fluid conversations (my talking, her moving), which often include spiritual messages I need to hear (whether I want to or not). I REALLY love that I have a name to use when talking to my friend. This is Dorothy, isn’t she beautiful? Have you heard of Healing Touch? If not here is a great post that explains Healing Touch. On Saturday, I had a Healing Touch session with Sarah, from Color My Spirit. In this session, the intention was to work on Beth, through me. I was the one on the table, while Beth was at my parents house playing the day away. 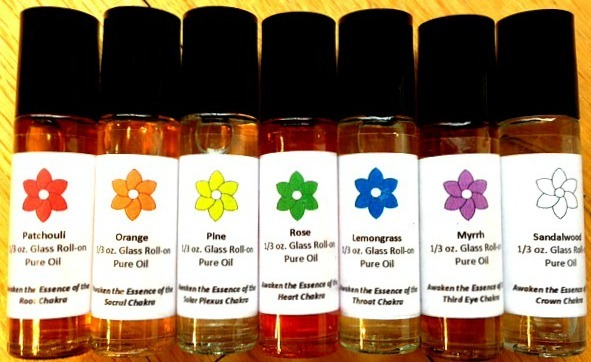 Before I left for my session, I put Chakra Balancing Oils on both Beth and myself. I also put a Chakra ring on both us. I then brought a picture of Beth, for Sarah to have during the session. Since Beth loves rocks, and is always on a quest for the perfect gold one, Sarah also placed a beautiful pyrite stone (amongst others) by Beth’s picture. We talked about what I hoped to achieve through the session. My main goal was to help Beth process, and move on from, the negative energy that resulted from bullying. She had been bullied for months in public school, and is still trying to work through all those emotions. Beth is Autistic, and for her that means her memories are sensory based. Unfortunately, many activities such as painting, eating, playing, etc… tend to bring back painful memories from her experiences at public school. Sometimes she talks about how sad she is, while other times she has massive meltdowns. I am doing my best to help her work through her emotions each time she shares an incident with me, but I was hoping Sarah and Healing Touch could help her on another level. The session was amazing! The energy that comes from Sarah vibrates in the air when she is working on me. When we started I had a lump, that felt like a rock in the upper left side of my chest. As the session progressed, the pain and weight I felt in that spot slowly dissipated. At times I had to take a deep breath, from the power of the energy moving through me. During the session, I felt another rock-like lump manifest in my lower abdomen and slowly travel up toward the center of my chest, where it rested, before dissipating as well. There were moments, when I felt as though I would weep, and others when I smiled from immense feelings of joy. Toward the end of the session, Sarah was moving her hands from my knee to my toes in a sweeping motion. Each time her hands swept downward, I felt as though she was pulling something out of me. My arms automatically stretched toward her, and I felt as though I was fighting to keep my body flat on the table. It was as if whatever she was focusing on, was being dragged out of every fiber in my being. I pray this helps Beth. The overwhelming feelings of peace and love that I felt at the end of our session, is something I pray my children feel countless times in their life. Today Beth and I are exhausted, despite both of us sleeping very well last night. Sarah warned that we may feel more tired in the coming days, as our bodies detox from the negative energy she attempted to remove. I will be watching Beth in the coming weeks to see what changes are apparent. I will also be paying close attention to myself, since Sarah sensed that I must heal my own (old) wounds in order to fully help Beth heal hers. There was one new thing today. For the first time, while talking about the boys who tortured her, Beth said: “I don’t like K anymore. He said I was bad team, but he is bad team and I don’t like him anymore!” This is HUGE, because just a few days ago, she was still crying about how he broke her heart because she wanted to be his friend and he didn’t like her. This change in her dialogue is like a beacon of hope for me! It is the shining star that tells me, she will not only overcome this, but she is going to use it as a base for something wonderful. I believe the Lord has great plans for Beth. I know she will encounter good and evil on her path. I also know that when she must endure the bad, He will help her heal, and take what she needs from those events. I am very thankful that He has blessed us with people like Sarah, to help her on her journey.